The OfficeUS Headquarters, designed by architects Leong Leong, consists of three fundamental elements: a Wall, a Table and a Curtain. The Wall, parallel to the external walls of the US Pavilion designed by Delano and Aldrich in 1930, contains 1000 OfficeUS Binders that present the Repository chronologically ordered from 1914 to 2014 and the 25 OfficeUS Issues in the form of black binders to be filled as the biennale unfolds. 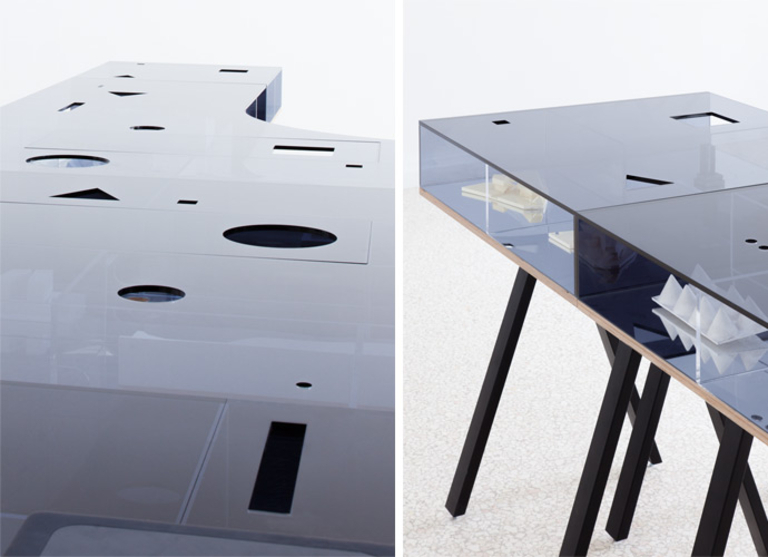 The Table, traversing the entire plan of the building, supports and fuses work, display and play with a series of historical, functional and curatorial objects, models and books. The Curtain, a composition of office blinds, transforms the space of the Giardini inside out making the courtyard of the US Pavilion the interior meeting table of the Biennale.